What part of the toe is affected? The toe bones connect to form the toe joints. 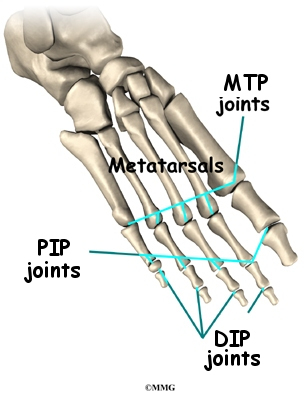 The metatarsophalangeal joint (or MTP joint) is the first joint that connects the toe to the foot. The ball of the foot is formed by the MTP joints. The second joint is the proximal interphalangeal joint (or PIP joint), and the last is the distal interphalangeal joint (or DIP joint). Each joint is surrounded by a joint capsule made of ligaments that hold the bones together. Two tendons run along the bottom of each toe that allow us to curl our toes, and one tendon runs along the top that raises the toe. 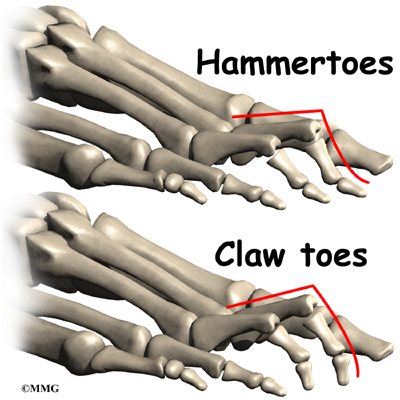 In a hammertoe deformity, the first joint (MTP) is cocked upward, and the middle joint (PIP) bends downward. A claw toe deformity has a cocked up MTP joint, and both the middle joint (PIP) and the tiny joint at the end of the toe (the DIP) are curled downward like a claw. Both of these problems can be the result of wearing a shoe that is too short. In many people, the second toe is actually longer than the big toe, and if shoes are sized to fit the big toe, the second and maybe even the third toe will have to bend to fit into the shoe. Shoes that are pointed make matters even worse. Combine pointed shoes with high heels, and the foot is constantly being pushed downhill into a wall with the toes squished like an accordion. A hammertoe in the second toe is also common in people who have a bunion in the big toe. 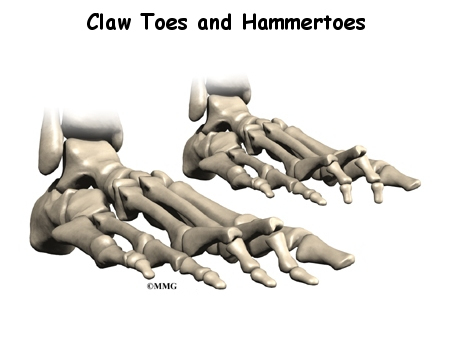 The big toe angles too far toward the middle of the foot, and the second toe can end up with a hammertoe deformity. Claw toes are common in people with high arches. And they can come from a muscle imbalance in which the deeper (intrinsic) toe muscles are weaker than the surface (extrinsic) muscles of the toes. This type of muscle imbalance can occur from more serious nerve problems. Painful calluses develop as a result of pressure from the shoe. Diagnosis of these two conditions is usually obvious from the physical exam. In some cases, it is important to check to make sure no other nerve problems are to blame for the condition, particularly when claw toes are present. Other special tests may be required. Treatment depends on how far along the process is. Early on, simply switching to shoes that fit properly may stop the deformity and return the toes to a more normal condition. If the condition is more advanced and the toes will not completely straighten out on their own, a contracture may exist. A contracture occurs when scar tissue tightens a joint and keeps it from moving through its normal range of motion. Pressure points and calluses caused by a contracture can be treated by switching to shoes that have more room in the toe or by placing pads over the calluses to relieve the pressure. If all else fails, surgery may be suggested to correct the alignment of the toe. The main type of procedure performed for these conditions is referred to as an arthroplasty. Arthroplasty is the reconstruction or replacement of a joint. For the hammertoe deformity, an arthroplasty of the DIP joint may be suggested. This procedure is performed through a small incision in the top of the toe over the DIP joint. Once the joint is entered, an arthroplasty is performed by removing one side of the joint. This releases the tension on the ligaments and tendons around the joint and allows the toe to be realigned in the proper position. Once the toe is in the proper position, it is held with sutures (stitches) or a metal pin while it heals. One of the most common procedures to correct the claw toe deformity is an arthroplasty of the PIP joint. In this procedure an incision is made over the joint. Once the surgeon can see the joint, the end of the proximal phalanx is removed to shorten the toe and relax the contracture around the joint. The toe is then either held with metal pins or sutures in the straight position until it heals. As the joint heals, scar tissue forms, connecting the two bones together and replacing the area where the joint once was. Surgeons refer to this as a false joint (or pseudo joint) because the scar tissue allows a bit of motion to occur between the two bones while keeping them from rubbing together and causing pain. If clawing is a problem, then the MTP joint may also have to be released to relieve the contracture of this joint and allow the proximal phalanx to come into the correct position. This procedure is performed by making an incision on the top of the toe over the MTP joint. The surgeon then releases the tight ligaments and tendons until the toe easily moves back into the proper alignment. The toe may be held in the proper alignment with a metal pin until the soft tissues heal. The pin may remain in place for three or four weeks. Patients with hammertoe or claw toe deformities may benefit from four to six physical therapy treatments. Your therapist can design a pair of shoe insoles or orthotics to correct associated problems, such as high arches. Recommendations may be given of shoes that have extra depth in the forefoot. The added depth gives the toes room so that bony areas won't rub inside your shoes. Therapists apply small cushions over callused or irritated areas of the toes. A series of stretching and strengthening exercises may be designed to improve muscle balance between the deep (intrinsic) toe muscles and the surface (extrinsic) muscles of the toe. Patients are usually fitted with a post-op shoe. This shoe has a stiff, wooden sole that protects the toes by keeping the foot from bending. Any pins are usually removed after the bone begins to mend (usually two to four weeks).